After a bit of work, we have the car running and a brief shake down. Plan is to have the mechanicals working before fixing body issues and repaint. As you can see the car is sitting up high over the 14" bottle caps. 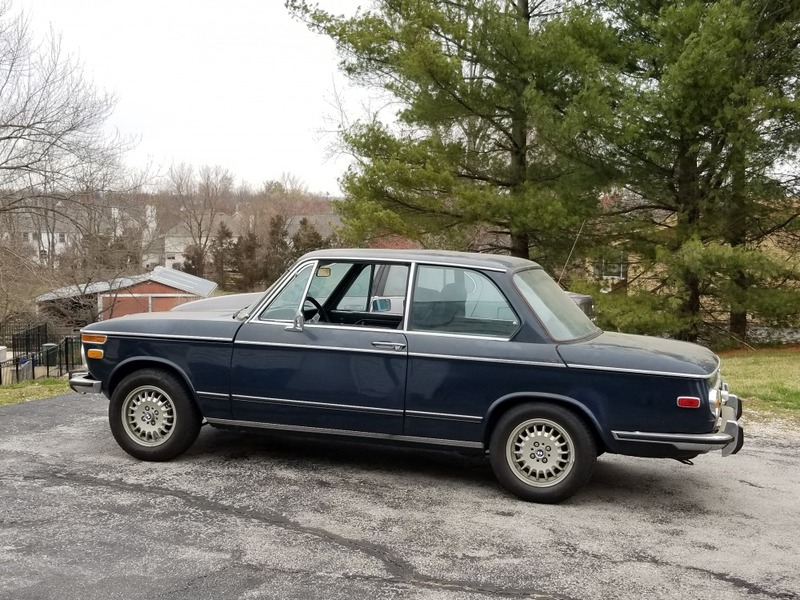 While the 73 is a chrome bumper, this was the first year for bumper regs with a 2.5 mile standard which was met by BMW with longer bumper brackets. It appears that the 73 had the space disks. So I am thinking of losing these and putting this at the European height. The rear shocks appear to be in 'Koni orange'. If we do the spacers, I will want to consider is a change in springs and shocks are in order. One question will be wheel clearance without the spacers, given the larger wheels. Any experience on the clearance with the 14" wheels? The clearance with e30 basketweaves is great, I think they are the same offset? Any of the ‘stock’ e30 wheels fit perfectly and as long as you have a 1 in front of your tyre size then you will get no rubbing. Removing the aluminum spacers from under the front fenders might take 30 minutes to do both sides. Super easy. Jack up the nose nose of the car. Remove the three strut top nuts. Reach under the wheel well and slip the spacers off the top of the strut. Raise the strut back into position. I suggest replacing the spacer on top of the fender, under the hood. This keeps you from having those long strut bolts exposed to gouge your knuckles on while working on other things. After the spacers are removed & the car is back on the ground, replace the 3 nuts on the strut bearing & cut off the long exposed threads. Hack saw or rotary tool does the job easily. Well. Unless you buy new strut bearings. You can purchase longer or shorter splined bolts. Or if you want the shorter bolts choose E21 strut bearings when yours require replacing. (Fairly) little known fact: Not only were the 73's bumpers reinforced (primarily with brackets) to meet the Federal 2.5 mph crash test, they were also raised, this by fitting taller springs to the 73's. I had wondered for years why my stock '69 sat an inch lower than my stock '73 until I found that out. These same taller springs were fitted to the 74-76 cars--that's a well-known fact. I fitted H&R sport springs and that lowered the car about 1.25 inches; still plenty of clearance but a much nicer stance. Or you can either fit stock springs from an earlier car, or cut yours. 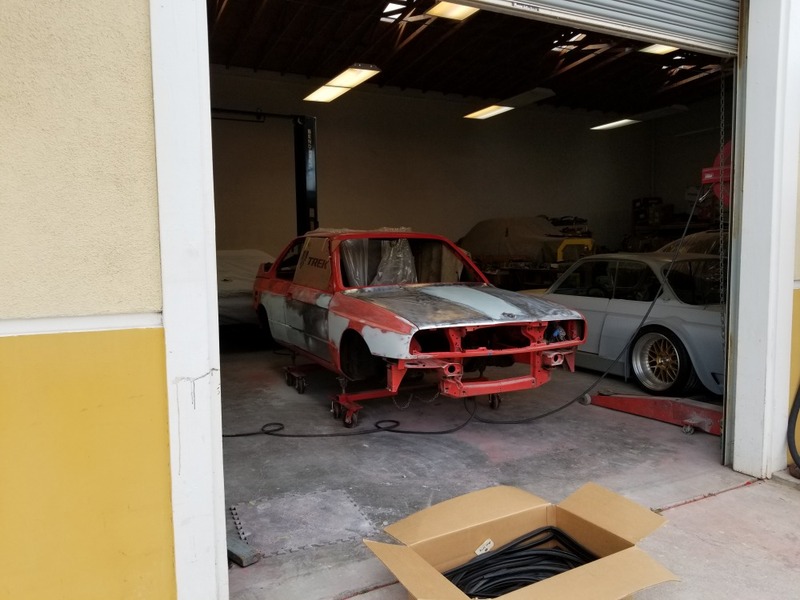 Placing the aluminum rings on the top of the fender eventually ruins the paint finish underneath, followed by electrolysis when the raw aluminum meets the raw steel. Live with the longer studs, shorten them, or use some replacement strut bearings from an E21 if you can't handle the first two options. Disconnecting the sway bar end link makes it easier to push down on the strut assy. Watch out for the strut banging around inside the wheel well while you have it loose. This was the first performance upgrade done to my first 02. Inbetween runs at my first autocross. The experienced club members had my car in the air, spacers pulled, and back out on course. Damn near NASCAR style. Almost as quick as an M3 resto! As the strut assembly is pushed down, it wants to go back at the top. The ratchet strap kept that under control. I did not undo the sway bar, so I had to lower both sides at once. The other side had the same setup. This was to put the spacers (back) in on top of the H&R springs. Make sure you are not tugging on your brake lines.